Is there such a thing as a standard marketing planning process and template? I was recently asked this question by a (non-marketer) friend and I believe the answer is yes. Pretty much regardless of the importance of the plan or the industry core specificities, the plan structures will be the same. Those are heavily documented in the marketing literature so I will not get into much details in this post. What I am proposing to share is a high-level, easily digestible, framework that anyone could apply to its particular need. One way of thinking about the analysis is that, similar to the mind sweep in GTD, this is the section where using –depending on the situation- a mix of quantitative and qualitative tools, market research and gut feel, brainstorm and rigorous analysis, you will gather in one place all the elements necessary to make the key decisions that will inform your choices of goals, focus area, strategies and execution. Segmentation will be needed in most cases very early in this analysis as each segments will have different dynamics, needs, pattern, timelines, constrains, potential… One simple way to explain segmentation is to think of it as the subset of customers that purchase the same product or services (or roughly the same) with the same purchasing behavior and customer profile. Tackle your weaknesses for the ones that need to be improved. Forget the others. Identify which threats (T) are the most dangerous and decide on mitigation strategies for those ones. The Tactics: Each strategy will be associated with one or more tactic, the actual activity you will carry out to execute this strategy. You will also see that a given tactic can influence several strategies. An example of the latter would be a trade-show participation that would, for instance, both help the “generate more new leads” strategy and the “show industry leadership” one. Amongst the classic tools to inform tactic development is the 4P model. I use an extended 6P framework for the high-tech B2B markets. Another one is the AIDA model, or its variations for your specific market and value chain. One last example would be to approach these by asking questions around breath vs. depth vs. tiered strategies for the given goal and have a toolbox of activities to chose depending on this choice., See here for an example of going through this process in 5th “P” (for Partners) of the 6P framework. From a graphical metaphor standpoint, this will be also a funnel, but starting narrow with a few goals and expanding as strategies and tactics get defined. Potentially combine, simplify or eliminate activities as getting into the detailed implementation exposes resources constraints or other blockers that forces re-prioritization. It’s also where continuous monitoring of these results, fine tuning, adaptation and overall real-life sanity checks will need to take place. 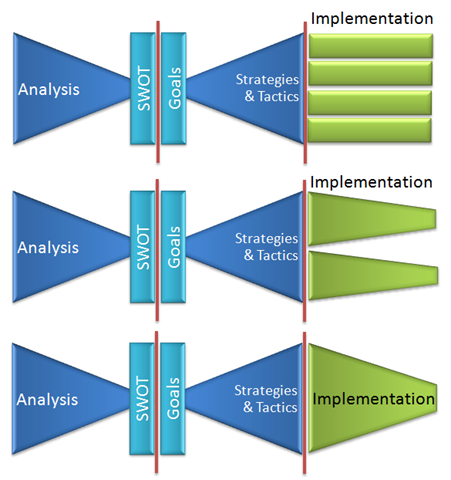 One way of picturing this phase can be as a shape starting as wide as the strategy one then staying as wide as the end of the strategy funnel (if all tactics are executed and are distinct), or narrowing, boiling down to a narrower set of core metrics and implementation aspects, down to potentially a bare-bone set of activities. What I just shared is nothing new or ground breaking in any way shape or form. It’s just a way for a newcomers to the process of strategic marketing planning to grasp, at high-level, the conceptual phases on this process. This process can, depending on the situation be extremely simple, such as 5 bullets points from analysis to executions and metrics, up to tens of pages (or more) of analysis and planning. In both cases, and anything in between, the high-level phases will remain the same. This entry was posted in Business - Marketing on April 30, 2010 by Olivier. Depth vs. Breadth vs ? In marketing we often use the dichotomy of breadth vs. depth strategies. Do you target a wide audience with your ads (e.g. TV ads) or do you focus on more ads in a single vertical medium (e.g. a trade magazine)? Do you build broad programs or do you go an engage customers or partners 1:1? In some businesses neither approach is the best one. When the business has a very complex, lengthy or challenging sales cycle a new paradigm is needed. If the customer requires many touch points before making a decision, if the product is very technical and will involve more training than selling between the awareness and the sale stage or if the players involved in the process will be of different functions, for instance technical managers, engineers, purchasers, senior execs, legal department, etc a third hybrid approach is needed. This is what I call “Scaled depth” marketing. Scaled depth is about building a programmatic, scalable but high-touch process to engage customers from awareness to sales retention. Programmatic: You need to standardize to a certain level the marketing and sales activities reaching those customers throughout the sales cycle, from the moment they first hear about you to the one they purchase your product. Scalable: These programs should intrinsically have a cost structure (human or $) that grows slower or ideally is flat as the sales pipeline grows. In other words, you want to ensure that a twice larger sales funnel will not involve twice the amount of investment in people and marketing dollars. High-touch aka Depth: These programs have to be built leveraging all the needed elements of a traditional B2B mix, but will have to be perceived by the customers (and rightfully so) as not being standard cookie cutter programs but as personalized 1:1 or 1:few engagements and activities. A blend of savvy use of digital marketing and value adding go-betweens such as distributors and partners will be often necessary to achieve this depth perception. In a later post I will provide some more specific examples of how this “Scaled Depth” model can be implemented. This entry was posted in Business - Marketing on April 19, 2010 by Olivier. I’m guest blogging today on Jerry’s Weissman’s blog on how his core presentation concept of “less is more” is also very applicable in another key communication medium these days: email. Readers of the Power Presentations blogs are well aware of the importance of the Less is More principle as it applies to presentation content as well as to presentation graphic design and animation. Some of the posts have also shown how the principle even extends to include merchandising and iPhone apps. Another important extension is to email. Style: A slide is not a word document—neither is an email. In a presentation, it is very annoying—if not patronizing—when presenters read long-winded sentences directly from their slides. It is equally annoying to receive long emails that transform a normally effective and direct communication medium into a tedious task of deciphering. For email communication to be effective it has to be brief and to the point. Don’t try to mimic a verbal conversation or a full report. A simple rule of thumb is to have the gist of your email appear within the text shown in the preview pane of Microsoft Outlook (also called “reading pane”). Your recipient should be able to known what is expected of him or her in one glance. Ideally, the entire email itself should fit within this preview. Obviously, this applies to regular email communication, and not to more complex communication, such as a division-wide strategy update, or sensitive subjects, such as a personal matter. Structure: Just as a presentation must have a logical sequence, so must an email. Purpose of the email: tell the reader why you are emailing up front, with the context following. This will help your recipient decide on the spot how much time and how quickly he or she wants to answer your email. Action items: Do you expect the recipient to read only, to reply, or to deliver a specific outcome? State what you want. Supporting information: Then add all the supporting information required, succinctly. In conclusion, if you apply the Less is More principle in your emails, you can get people’s attention, receive responses on time and be perceived as efficient by your peers. A Microsoft executive once told me, the people with whom you are communicating are smart. If they need more details, they will ask for them. This is true both for presentations and emails. This entry was posted in Business - Marketing on April 16, 2010 by Olivier.